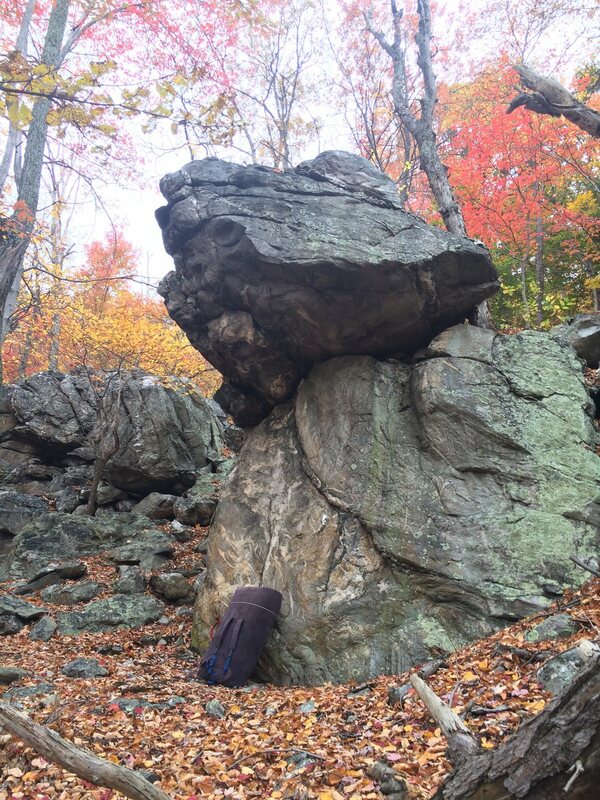 The Iron Pickle is a V4- boulder problem on the Throne boulder in the upper Highlands area on Elk Ridge, MD. It is about 25-30 feet tall and involves both slab and roof climbing. The problem has a secret hold that is pretty much invisible from the ground, from the top of the boulder, and from any nearby vantage point you can gain by climbing or walking. The physical crux is probably getting to the secret hold but the mental crux is moving upward from there. The landing is pretty flat and has a rock or two sticking out but nothing close to being jagged and gnarly. The Iron Pickle climb the slab and comes out the overhang and up the headwall. Below are photos taken by Coco Boan. She did a good job of capturing nearly every move on this problem. Thanks go to her. Scott grabbing the S shaped jug rail with his left hand. Spotting the secret hold before making the move. Scott going for the secret hold. Scott sticking the secret hold. Scott placed his right foot on and moved his left hand to the crimper on the lip of the upper slab. Scott cut his feet to get his right foot up on the lower slab hold. Drew is taller than Scott and his beta was slightly different through the overhang section. Here is a few of Drew where his beta was different. After Drew stuck the secret hold he cored up and got his left foot on/in the S shaped jug rail. Drew brought his left hand up to the crimper and began to explore the use of a jug out right under the roof as foot hold. He then moved his right hand up to a horizontal, dropped his left to the secret hold, and then moved his right up to the lower eyebrow. Here Drew is using a horizontal and has dropped his left hand to the secret hold. He next moved to an eyebrow and high-stepped. And that is the Iron Pickle breakdown. Though Scott and Drew climbed it without incident this problem has the potential to really wreck you if you fall. Be safe out there.